The new QUADRASORB evo™ Gas Sorption Surface Area and Pore Size Analyzer allows users to run multiple independent samples synchronously at variable start times. 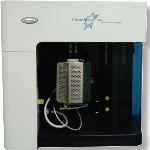 The flexible field upgrade paths provided by Quantachrome enable users to procure equipment depending on their current lab requirements, but with the flexibility of upgrading to micropore capability for low surface area analysis or upgrading analysis stations for optimized throughput at a future date. Accurate B.E.T surface area measurements can be rapidly obtained with the standard evo™ version. High throughput industrial material characterization labs can analyze multiple samples at drastically improved speeds using the new B.E.T Quick Mode™. Advanced material characterization can be performed with the micropore equipped version, which can measure extremely low surface area samples and microporous materials with the help of a 1torr low pressure transducer and turbo pump. QUADRASORB evo™-KR/MP for low surface area and micropore measurements features all of the functions of the standard model QUADRASORB evo™ in addition to low surface area measurement through Krypton adsorption or low pressure micropore characterization. It is equipped with low pressure (1torr) sensors and an oil-free turbomolecular vacuum system. It carries out Krypton gas sorption measurements to determine very low surface area of powdered metals and pharmaceutical actives. It delivers low pressure adsorption data (as low as 4 x 10-5 P/Po) crucial for comprehensive characterization of microporous materials, including activated carbons, zeolites, and molecular sieves. Two measurement techniques are available as options: Patented NOVA® helium-free method or classical helium void volume method.